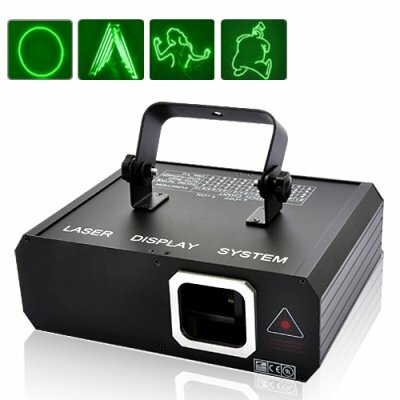 Successfully Added Animation Laser Projector - Green Laser Effects to your Shopping Cart. Take laser effects to the next level with this all-new, unique Animation Laser Projector. With a green laser beam projecting many fun, animated cartoons (including a walking cat, pacman, dancing girl, and so much more!) this never-before-seen Animation Laser Projector will wow friends, guests, and customers like never before and is guaranteed to put a smile on their face. Cartoon Animation Effects: If you're in the mood for something unique and never before seen... feast your eyes on this laser projector's amazing animated cartoons, including dancing girls, walking cats, penguins, elephants, pacman, and so much more! With so many fun and interested animations, this Animation Laser Projector is guaranteed to put a smile on your face and leaving everyone who sees it going "wow". Mesmerizing Laser Designs: With the Animation Laser Projector, you also get beautiful green laser designs that jump everywhere and lighten up the mood. Mesmerizing circles, lines, and square laser projections make this gadget your ideal picker-upper, no matter where you use it. Sound Activated Laser Designs: With its sound activation feature, this Animation Laser Projector can intelligently change its color/pattern to match the beat of the music! How? Just set your stereo system nearby and the projector's mic will pick up nearby music vibrations, so if you turn up the noise the laser will respond in style! This Animation Laser Projector is fresh out of R&D and in high demand, so be sure to get your orders in now while supplies last! Available only at Chinavasion, your source for wholesale electronics and laser devices. Can I change the animations to my own designs? No, this laser animation projector comes with default designs that cannot be changed. If you plan on making bulk orders (100+) of this unit, however, please contact our CS team and we may be able to help. I brought two of these projectors as they were such good value, and the range of built-in effects, and brightness of the laser are superb. Managed to light up the dancefloor of a 1500 capacity nightclub and the clubbers liked it! We ordered this product for a show, for the price and control, it's an amazing green laser, this 12 channel DXM control was great at our last show!